The combination of UC's successful strawberry breeding program with an array of north-to-south micro-climates allows California producers to harvest strawberries somewhere in the state practically year round. 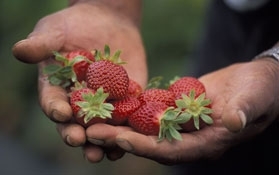 This year's wet, cool winter, however, is getting some of California's traditional springtime strawberry powerhouses off to a slow start, according to UC statewide strawberry specialist Kirk Larson, based at the UC South Coast Research and Extension Center in Orange County. There haven't been too many frost or freeze events in Southern California, but it has been well below normal temperatures, resulting in uneven ripening. UC has an undeniably critical role in the success of the state's strawberry industry. UC-developed cultivars are grown on 65 percent of California strawberry acreage. Speaking to the productivity of UC varieties, those plants produce 85 percent of the state's fruit. "The big beneficiary of all of this is the consumer," Larson said. "Because there is just so much good fruit, the price is usually affordable." One of the most popular UC varieties, Albion, was selected by Larson and UC geneticist Doug Shaw for its flavorful, sweet berries, productivity and long shelf life. Other popular UC varieties are Palomar, San Andreas, Diamante, Camarosa and Ventana. Shaw noted that many California place names and plant variety names honor the state's Hispanic heritage. Shaw wanted the new variety to honor California's English heritage, in the person of explorer Sir Francis Drake. "But I discovered that 'Drake' is a bad name for a strawberry," Shaw said. Sir Francis Drake dubbed California 'Nueva Albion' when he claimed the territory. Albion, the oldest recorded name for the island of Great Britain, became the label for a strawberry variety now grown on about 15,000 acres in California. More information on the UC Strawberry Breeding Program is available on its Web site.